Our favourite panda is back!! After a hiatus of 4 years, here comes Kung Fu Panda in a new avatar and with much greater penchant for fights! Touted as a comedy flick with martial arts sequences interspersed with it, the 3rd instalment in the series is produced under Dreamworks Animation and 20th Century Fox movies. With family as the background play, the Po (Jack Black) reunites with his biological father Li and they travel together to a secret village full of Pandas! The movie revolves around how the new villain-demon Kai threatens villages across the Chinese mainland by his overpowering Kung Fu tactics and how our cute panda teaches the village to defeat him. Slated for a world wide release on Jan 29th, 2016, it was widely anticipated to continue from where Kung Fu panda 2 left off: a village waiting for Po. Po thus is going to be the hero that he never thought he would be. 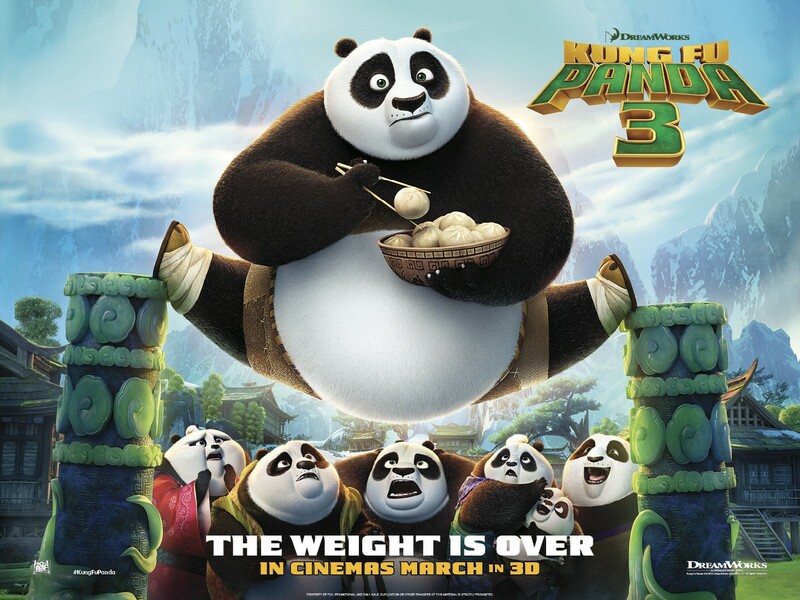 With the featured fight sequences almost rivalling those performed in live-action blockbusters, there is great excitement around Po’s role alongwith Furious Five (voiced by Jackie Chan, Lucy Liu, Angelina Jolie, David Cross, and Seth Rogen) and Master Shifu (Dustin Hoffman).Black has always been pitch perfect in the lead role. Well, the pandas curiously enquiring the dad as a matter of fact that how he could be so sure of Po to be his son, for which the introduction is hilarious. You have to watch the trailer to enjoy more of it! Their journey to the secret panda village in the mountains, their fight over the mighty Kai, the cuty Panda’s endeavours and struggles in teaching Panda to a whole new village and the eventual climax of who wins shall form the crux of the story, as the trailer would like us to believe! Finally, the scene of final confrontation where Po nonchalantly roams about his business while Kai is furiously talking and bullying him to fight. To those who are die-hard fans of Po’s style, it is a real treat to watch how he teases the demon – a rhythmic Chitty-Chitty-Chat-Chat! Well… here is the trailer for Kung Fu Panda 3 directed by Alessandro Carloni and Jennifer Yuhfor all you Kung Fu Panda fans to enjoy! !